BONITA SPRINGS, FL – August 28, 2014 - Interactyx is honored to announce that Rotary International, a multi-year client of Interactyx’s learning management software, TOPYX®, was named a 2014 Learning! 100 award winner by Elearning! Media Group, publisher of Elearning! And Government Elearning! magazines. In its fourth year, Elearning! Media Group’s Learning! 100 Awards recognize excellence in learning across enterprises that invest in immersive learning culture. Learning! 100 Awards recognize the top 100 organizations for their best-in-class learning and development programs, enabling learning culture that creates outstanding organizational performance. Rotary International’s global volunteer base of nearly 1.2 million works together to overcome local and international humanitarian challenges. A primary reason for Rotary’s recognition of the prestigious Learning! 100 award is due to its utilization of social learning management technology for better collaboration and sharing through peer-to-peer learning. Rotary has established nearly 100 unique social communities of learning within their instance of the TOPYX learning management system (LMS). Rotary engages its membership with a scalable, online learning environment that does not come with cost prohibitive user or bandwidth fees, which would be excessive in deployment to its 1.2 million membership base. Interactyx is the developer of TOPYX, a leading social LMS software. TOPYX is an award-winning and comprehensive software-as-a-service (SaaS) eLearning platform which engages learners and provides collaborative learning environments for businesses, associations, nonprofit organizations and eCommerce needs of any size throughout the world. “Learning is a core success factor within their organizations that drives business performance. From improving retention rates of new hires to instilling leadership values that drive performance across all team members, every one of us can be inspired and empowered by the Learning! 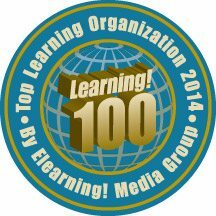 100 organizations’ successes,” says Catherine Upton, Group Publisher, Elearning! Media Group. Rotary brings together a global network of volunteer leaders dedicated to tackling the world's most pressing humanitarian challenges. Rotary connects 1.2 million members of more than 34,000 Rotary clubs in over 200 countries and geographical areas. Their work improves lives at both the local and international levels, from helping families in need in their own communities to working toward a polio-free world. Elearning! Media Group (EMG) serves the $220 billion enterprise learning market. EMG, owned by B2B Media Group, LLC, consists of 13 media products including Elearning! and Government Elearning! magazines. In combination, these brands reach more than two million executives, practitioners and professionals, all evaluating or implementing enterprise learning and workplace technologies across their organizations each year. Interactyx is a global eLearning software company providing engaging and interactive learning experiences to learners, businesses, associations and nonprofit organizations of any size. Since 1995, Interactyx has worked with educational programs to develop engaging learning management solutions. Interactyx, the developer of TOPYX, is at the forefront of developing eLearning and social learning management system (LMS) solutions that engage learners and enhance collaborative learning environments. TOPYX has gained acceptance as an innovative, affordable solution to deliver a complete eLearning software solution meeting the needs of today's learner that is the best value in social learning software. Interactyx ranked no. 790 in Inc. magazine’s Inc. 5000 listing of fastest-growing private companies.